Somehow, we all managed to get up in time for the anticipated early start. 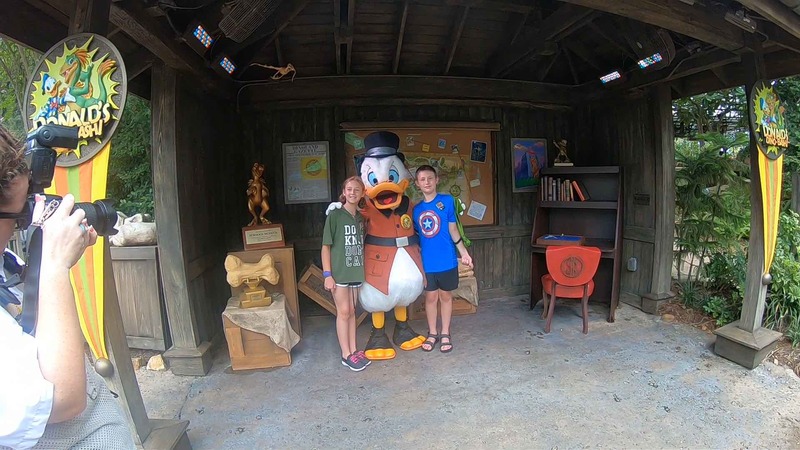 We needed this to happen if we were to stand a chance of getting a full day in at Disney’s Animal Kingdom. Today is a milestone day. 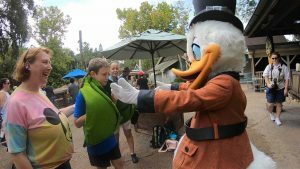 It marks the very last day of our all access Disney pass, so this will be the last time we visit a Disney theme park for quite some time – certainly for this trip. We had no idea at the outset how long we were going to be spending at Animal Kingdom today. We thought we’d at least get there early enough so that if we had a long wait with our DAS return time for the Flight of Passage ride, we’d still have time in the day to do a few other things. Rather than traversing most of 192 this morning and doubling back, we went to the Waffle House on SR27 this morning. It’s just past the exit to 192, so we’d still need to double back a little but not nearly as much. Breakfast was good and otherwise uneventful. So far, nobody had killed anyone. I took that as a good sign. We rolled in to the Animal Kingdom car park by around 9:45am. Being the newest of the Disney theme parks (although it opened back in 1998), it’s one of the easier car parks to get from the car to the front entrance. The tram takes you right up to the front. EPCOT does so also but not quite as close. With Hollywood Studios, the construction that’s going on for the new Star Wars area means there’s a bit of a walk. With the Magic Kingdom, you have to get a ferry or the monorail. We queued up to get through the bag security check along with everyone else that got off our completely full tram. Naturally, we just happened to pick one of the tables where officer ‘slow and thorough’ was on duty. He was taking what seemed like forever to go through one particular customer bag just in front of us. You’d have thought he’s received a tip-off that this particular customer was a threat or something. After several minutes of no progress in this line, I shifted us over to the next table. Just at that moment, all the screening officers evidently did one of their rotations. Wouldn’t you know it, officer ‘slow and thorough’ shifted to our table. Just as I was about to pull what’s left of my hair out, another officer tapped him on the shoulder and he was replaced. The new officer was rather pleasant and chatty. He went through all our bags with little fuss and sent us through to the ticket turnstiles. We all tapped on and turned the blue mickey to green, indicating our tickets were validated and we were free to enter the park. 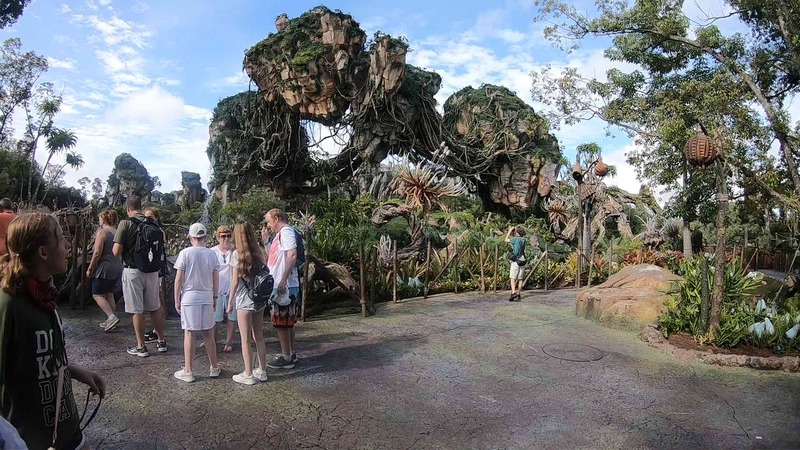 With free reign in the park, we hightailed it over to the world of Pandora, the most recent addition to Animal Kingdom. It was still impossible to book fastpass times for any of the attractions here (it has been for months) but we had DAS passes and weren’t afraid to use them. Using a bit of social engineering, we managed to get a pretty decent return time of around thirty-minutes. That gave us plenty of time, alas, to visit the giftshop, where I was relieved of the burden of more of my money. I keep telling myself it’s no use being the richest man in the graveyard. Joey managed to secure himself a banshee puppet toy, just as Jennifer did on our previous visit. Do you think he could leave it in the box so that we could collect it at the end of the day, as opposed to walking around with the sodding thing all bloody day? Of course not! We did send the box and some accessories to the front of the park for later pick-up, so that was at least something. Although I have complained in these blogs about the spending we’ve been doing, I do remind myself every now and then that we knew this going in and that we planned to do so from the outset. Emigrating is not something the kids asked for or even wanted. We’ve been deliberately spoiling them both. Joey in particular has picked up quite a few new additions to his toy and LEGO collection. Jennifer less so but I suspect that balance will be redressed when we get to the Universal section of our holiday. Those are the theme parks that feature the wizarding world of Harry Potter, where Jennifer will be in her element. 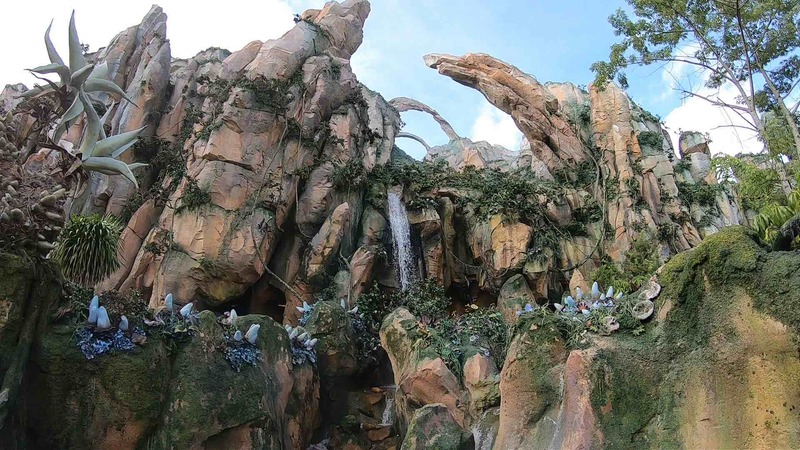 I managed to get some really great footage today of various parts of the park – including several walkthroughs of the Pandora section. 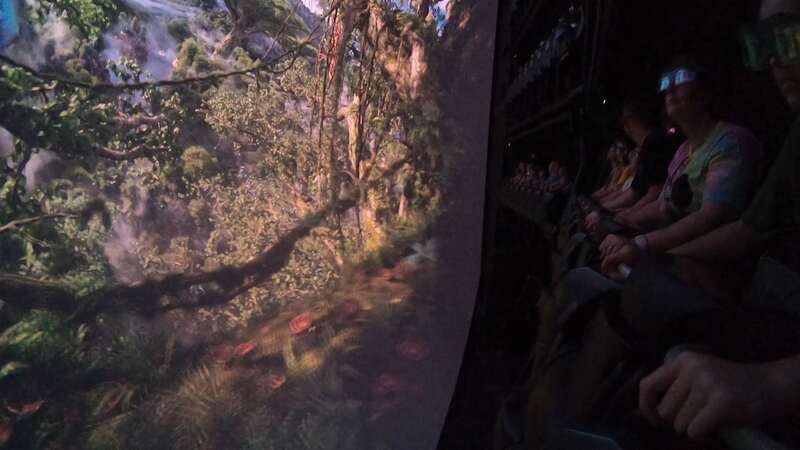 I even managed to get several complete start-to-end videos of a number of rides and attractions – including the Flight of Passage in Pandora. The video, although looks absolutely stunning in high resolution, really doesn’t do the Flight of Passage ride any justice. 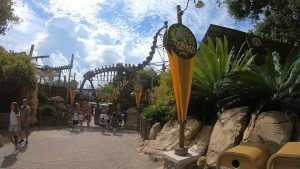 It’s got to be one of the very best rides I’ve ever experienced – and that’s saying a lot given the number of theme parks I’ve been to in various countries over the years. 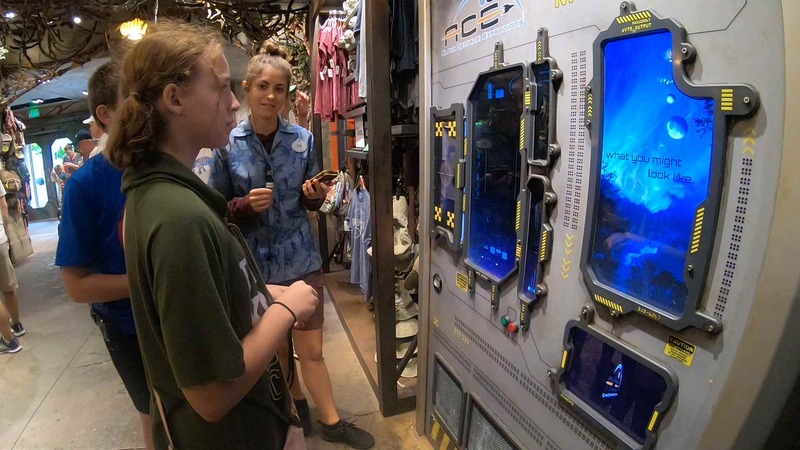 We finished up in the Pandora shop and went through to the Flight of Passage ride. Once again, it was a mindbogglingly fantastic experience. Since I was now familiar with the ride itself, I paid a little more attention to the behind the scenes mechanisms and how the whole thing works. I won’t give away too many spoilers here, but suffice it to say that no fewer than 128 people experience the attraction at a time (although it only looks like you’re going in with 16 people at a time). The ride duration itself is around five minutes (although that doesn’t include the various pre-boarding rooms you go through before you actually experience the ride itself. Even at 128 people at a time every five minutes or so, there are still often queues of well over two hours to experience the ride. Mental. In a weird twist of fate, just as we were reaching the front of the line to go into the first chamber that leads up to the ride (where your group is shown a video that provides safety information and other instructions – all beautifully themed of course), two cast members were just finishing their rotation. Jennifer noticed their name badges. One was called Morgan and the other Chris. We had a bit of a laugh about it with them but didn’t quite managed get a photo with them before they left through a staff only door. We came out of the Flight of Passage ride all completely exhilarated with grins from ear to ear. Even Joey was bouncing up and down. We passed through the exit shop (this time with a little more urging from me to get through it quickly) and out into Pandora. After some more admiring of the surroundings – totally awesome incidentally – we made our way into other areas of the park. 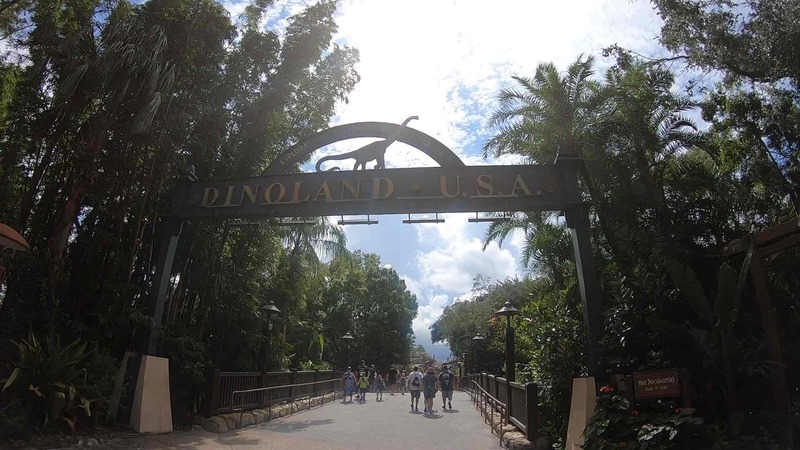 Our next destination was Dino Land. 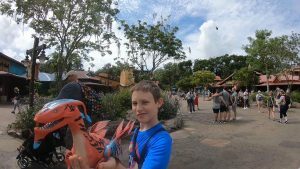 We had a fastpass slot booked for the Dinosaur ride. It’s a bit more of an intense thrill ride than I was anticipating would be tolerable for Joey. I thought the best approach, however, was to not overplay this and just allow him to experience the ride. Then I caught Sandy telling him is was a thrilling and scary ride and asking him if he would be OK with it. In my mind, drawing attention to those facts just increased exponentially the likelihood that Joey would indeed be uncomfortable with it. I didn’t say anything (until now – although I did mention is under my breath on the video I was making at the time). In the event, Joey was OK with the ride. 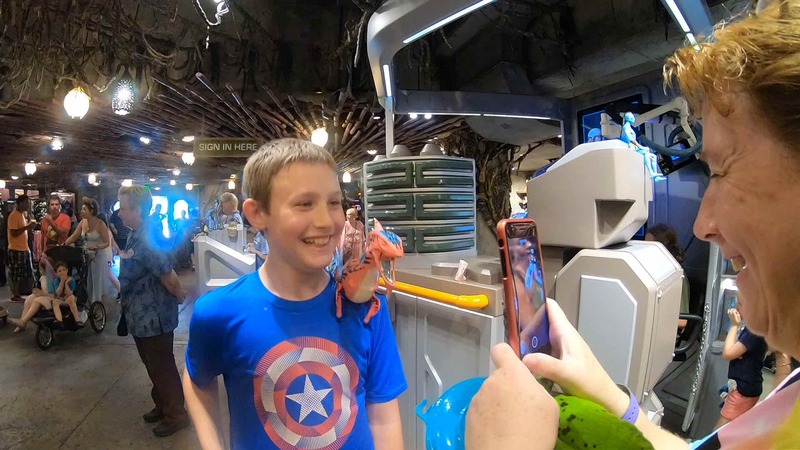 He has a bit of a fascination anyway with dinosaurs, so there was plenty in the pre-ride entertainment and around the building to keep him distracted. Although we all had a good breakfast, the exertions of the day – just walking can be an uphill struggle in the Florida heat and humidity – and the fact it was now approaching noon, meant we were all ready for a bite to eat. We found a spot at the restaurant in the Dino area. Most theme parks have restaurants in each of the main sections. This was after we were reunited after an impromptu character photo shoot opportunity. These are dotted around the parks also. Lunch was an uneventful affair. Just about the only thing worth noting was that when we all got up to continue our sojourn, I realised my hat was missing. This was a bit perplexing, as I had been wearing it for most of the day to this point. I retraced my steps, but we couldn’t find it. There was an outside chance it might be handed in. All lost property makes its way to the front of the park, so we’ll check there on our way out. Fortunately, I had another hat in the backpack. For some bizarre reason that confuses me almost as much as it annoys me, neither Sandy nor the kids like nor tolerate wearing hats. I’ve long since given up on trying to convince them it’s a good idea, it keeps them cool, it protects them from sunburn, etc. The urge to ‘parent’ on this subject is strong but the resignation that I’m pushing that futile boulder uphill has reached a similar strength. The two now cancel each other out. Let them burn! Our second pre-arranged fastpass of the day is a character photo shoot with Mickey and friends. This is something a bit more substantial than a quick shot with one of the roaming characters. It’s done inside, is well managed, with the queue diverted out of sight of the photography studio right up to the last moment, and takes place in an environment that’s much more photographically suitable. I used to think that donning a character suit and posing for photos with the streams of tourist revolving through was an easy gig. I’m not so sure any more. I’ve been watching how the characters interact with the plethora of different types of people. Whenever there’s a younger child that’s skittish or unsure (sometimes even scared and/or crying or screaming), for example, the characters seem to act in a very particular and deliberate way. They keep their distance, use specific hand gestures to portray non-threatening emotions and so on. If the child they’re with is a bit more rambunctious, they play around with them more, make more physical contact, etc. It’s complicated. What we as passing tourist get to see is but the tip of the iceberg of different behaviours and ways of interacting they are capable of. I now think there must be much more training the actors need to undergo than I previously thought. The character shoot with safari Micky and Minnie marked the point that the family split up and went off to explore the park in pairs. Sandy took Joey. Jennifer and I wandered over to Asia. Our intentions were to go and do the Expedition Everest ride again. On the way there, we passed the Kali River Rapids water ride. Unable to pass up an opportunity to get a little wet (and I use the word ‘little’ quite wrongly), we checked to see how soon we could get a DAS return time for. As luck would have it, and with a little more of that social engineering I’ve become quite good at, we were able to get in really quite quickly. I had the GoPro with me throughout today and managed to get a completely unbroken start-to-finish recording of the entire ride. Half way through the queue, I noticed just how dripping wet the people coming off the ride were. Hmmm. Perhaps I shouldn’t have immediately dismissed the idea of putting our things into those lockers we passed earlier. Oh well, too late now. Perhaps we’ll only get a little damp. No such luck. 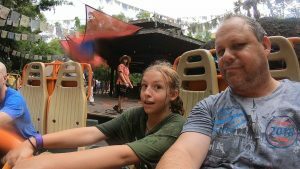 The round boats on the same ride in Queensland we did a few years ago had a lid on the centre section, where you could stash your backpacks and so on, so they wouldn’t get wet. These boats had no such lid. We didn’t only get wet through some of the accidental water encounters throughout the ride. The ride itself is engineers to ensure everyone gets a really good dousing. We came out just as dripping as all the other victims I had earlier seen emerging – as did the backpack. Fortunately, it’s a pretty good backpack and largely water resistant. It was also still relatively hot, so we dried out for the most part during the course of the afternoon. 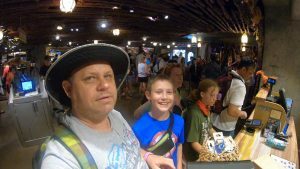 Together with the few extra kilos of water we were toting on our person, we made our way over to the far side of Asia, where the Expedition Everest ride awaited. Once again, we collected a DAS return time. It was about twenty-minutes, which was fine with me. That would give us a chance to dry up a little more, making us more comfortable for the ride. I checked the GoPro. The battery indicator was flashing at me, so I removed it from the handle grip and casing to replace the battery. In the backpack, I had earlier in the morning packed the dual battery charge and left it plugged in to the 20,000mAh battery pack. The completely charged second battery gave us thus a couple more hours of footage capacity for the rest of the day. I have a 64Gb memory card in the device. Even at the 1080 resolution I have it set to, this means it’s the battery that’s the restricting factor when it comes to how long we can use it. The quality of the footage this thing produces is truly amazing – and there are still a couple of resolutions available higher than the 1080 its currently set to. It doesn’t make a lot of sense to increase to a higher resolution. It would just fill up the memory card (not to mention the laptop) much sooner. It would be a real shame to not reach the end of the holiday before the laptop hard disk fills up completely. I do have a 2Tb backup disk but I’m using that for Time Machine backups and don’t really want to encroach on that space unless absolutely necessary. 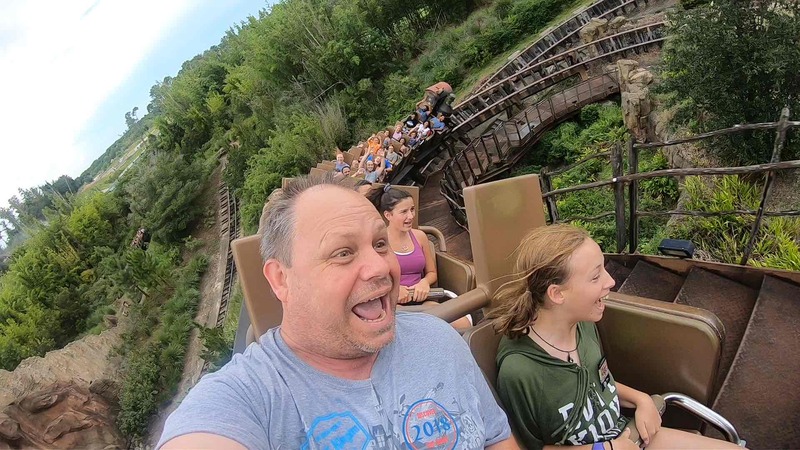 Armed with a fully charged GoPro with lots of available memory, we got into the Expedition Everest ride. Once again, I was able to film the entire thing in a single, unbroken recording from start to finish. I remain somewhat surprised that none of the Disney cast members have raised any concerns about me doing this. The ride was totally awesome – so much so that Jennifer begged me to take us around again, which we did. 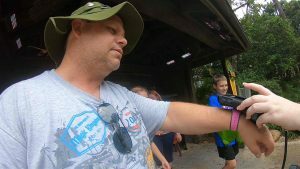 This second time, I held the GoPro facing us throughout the duration of the ride. Incidentally, when it came time to review the GoPro footage at the end of the day, I noticed that each time I held the camera in the air and pointed it backwards, so as to see what’s behind us, people were waving at it. 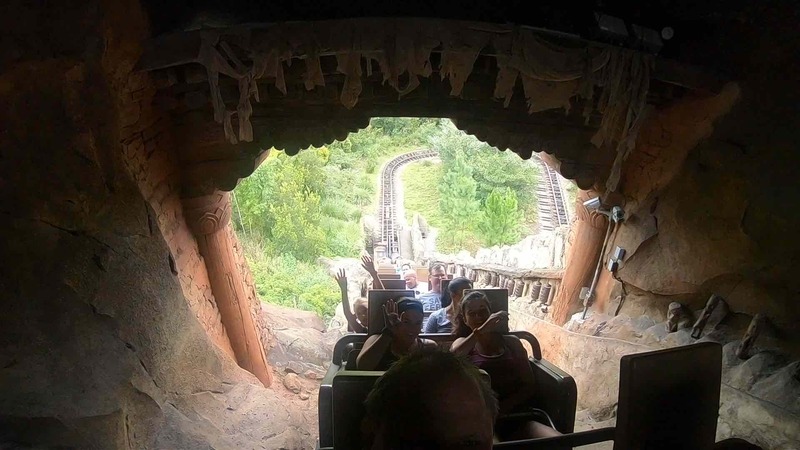 In the Expedition Everest ride, for example, a couple of young women in the seats behind us kept waving at us each time they realised they were on camera. It’s really quite amusing after the fact. When we finally tore ourselves away from the Expedition Everest ride, I found a handful of messages from Sandy. Each seemed to escalate in its tone of irritation. I’ve now submitted planning permission to install a pool house in the kennel. The safari tour was about as interesting as it could be given it’s not a very large area and there are safari trucks passing by the animals every one to two minutes. We did see a good range of animals and the running commentary from the driver was very good. When the safari was over, there seemed to be quite a backlog of safari trucks waiting to offload their passengers. It was until we got close to the disembarkation point that the situation became clear. One of the disembarkation terminals was closed. There were a couple of uniformed officers there chatting with a guest. We’ve no idea what altercation had played out there, but it was obviously serious enough to warrant bringing in the security to deal with the situation. The safari ride marked the final fastpass that we had arranged for the day. This meant there was nothing further planned. We were now free to go where we wanted. In the event, that meant back to Pandora. Jennifer had been wanting one of those customised avatar dolls. Sandy had evidently decided she was going to allow Jennifer to have one. I wasn’t arguing. In fact, Sandy had also bought a soft toy for Joey earlier in the Dino land. It was a set of strap-on pterodactyl wings. Both Sandy and I have been rather lenient with the kids and their request for new toys today. Perhaps it’s because it’s the last Disney day or something. Whatever the reason, neither child was complaining. Back at Pandora, we again marvelled at the gravity-defying boulders all around. The world of Pandora from the movie has a substance called Unobtanium in the ground. It’s a superconductor that’s supposedly the reason why the boulders and rocks defy gravity and float in the sky. Disney have done a fantastic job of making it appear there are huge boulders that are rising into the sky with moss, vines and even waterfalls running off them. 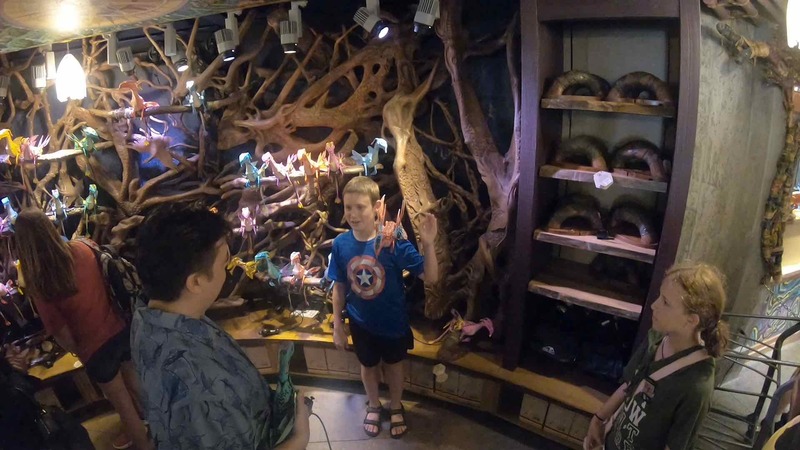 In the Pandora shop, Joey went through the process of having his banshee named and reciting the pledge, which is something they do – part of the overall purchase process. Did elected not to do this when we first bought the banshee earlier on in the day. There was a Disney photographer on hand, so we had some great photos of the entire process as well just for good measure. Joey was showing one of the cast members his new banshee. To their credit, the cast members have all been very good with Joey, taking a keen interest in him and chatting with him about his day and his toys. One especially friendly cast member was even so good as to give Joey a small bag with some spare accessories for his banshee. He had these in the box that was sent to the front of the park at the start of the day, but she wanted him to have them, so he could clip his toy on to his waistband and shoulder while he was in the shop. That was a nice touch. Well-played Disney again. As we were here for Jennifer’s avatar doll, she went through the process of having her head and face scanned and choosing the accessories for her doll (things like clothing, eye colour, etc.). She was then issued with a special credit-card-sized plastic ticket with a number on it. When we came back after the forty-five minutes it takes to build the doll, she would use that ticket to collect it. In the meantime, this gave us a chance to sit for a while at the adjacent restaurant and have a drink before our return time for the Flight of Passage ride. I took the opportunity to do a quick walk around with the GoPro to take in the very nicely themed surroundings. Our return time arrived, and we went through the fastpass entrance again. In doing so, we were going to miss out on some of the theming that keeps the queueing riders entertained. That was a price worth paying, however, given we would be shaving off perhaps ninety-minutes or more of queueing. This third time around, I decided to be bold and record the entire ride from start to finish – including the actual ride itself and not just the lead up to it. I half-expected to be asked to shut the video off. Just as has been the case pretty much everywhere so far, nobody noticed I had the GoPro – or they did notice but just didn’t care that I was filming. In recording the ride, I managed to see a bit more of how the ride mechanics physically work. For a third time, we completed the totally awesome ride and all emerged buzzing from the experience. We made our way through the exit and into the shop. Jennifer went through the process of collecting her personalised avatar doll. It wasn’t as straightforward as just presenting her ticket and collecting it. No, there’s an entire process you have to complete. Your ticket is scanned in a machine that has several screens. Through different video clips and other imagery that played out on those screens, the machine gives the appearance of the doll being constructed on the spot. It’s a great little piece of theatre for the kids. Jennifer lapped it all up. With her new doll in hand, we had one final look around the shop before I ushered us all back out into the bright sunlight. Collecting Jennifer’s doll marked the last objective of the day. Everyone felt we had well and truly ‘done’ Animal Kingdom now. It was time to leave. Indeed, it was time to say goodbye to Disney altogether. Today is the last day of our all access Disney theme park tickets. 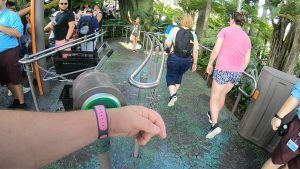 We would have no further need for the magic bands after leaving the park. Back at the park entrance, we found the package pick-up window and collected Joey’s banshee toy box. There was one final stop at Guest Relations to see if my hat had been handed in. Alas, no such luck, so we made it out to the tram and back to the car. During the drive home, we talked about me possibly going back to the Magic Kingdom tonight. I wanted to see the light and laser show at Cinderella’s Castle. The problem was that there might be a storm later this evening. I was also really quite tired. The car was giving us problems tonight. The CarPlay system that integrated with my iPhone when plugged in was not activating as it should do. We’ve had intermitted problems with this for the past week or so. Regardless of what we try, such as using different cables, different phones, different USB ports in the car, etc., the system just doesn’t activate sometimes. Occasionally when this happens, we can turn the car off and on again and everything comes back to life. That stubbornly didn’t happen this time. Adjacent to the Publix supermarket just around the corner from our resort is a British fish and chip shop. We’ve seen it a couple of times and decided we’d investigate whether it might suit as our dinner venue for the night. Much to Joey’s disdain (he wanted to go straight home), we stopped at the Publix car park and went in to see what it was like. Alas, I was disappointed. It turned out to be little more than an ordinary restaurant that just happened to have cod and chips as one of its menu items. Despite the British theming, there really didn’t appear to be much about the place that was British. Giving up on the idea of a real British fish and chips supper, I left Sandy and Jennifer at Publix and drove Joey home. He was done for the day and needed to get back into his bubble at home. I had a hankering for a Chili’s, so I thought I’d give their take-out service a go. Sandy didn’t really want to eat but the kids wanted a MacDonald’s for their supper. After placing my order via the Chili’s website, I drove back to Publix to pick up Sandy and Jennifer. It was a good thing that I did as it took considerably longer than anticipated to collect this evening’s food. There were road works on SR27 for one thing, with two of the three lanes closed down. It took forever to go through the MacDonald’s before we got the kids’ food (it always seems to – we can’t explain why). Then I had to turn right out of MacDonald’s and then do a U-turn, since there was no break in the median for me to do a left turn. A series of no U-turn signs then conspired to send me a couple of miles in the wrong direction before I could turn around and head to Chili’s to collect my food. By the time we got there, it was a full half an hour later than the time I had indicated I’d be there to collect. Naturally, since I was in a hurry, we hit every last bloody red traffic light. The food was still warm when we arrived, although only barely. Back home, I enjoyed my food only marginally less than would have been the case had we been at the restaurant – even though I had to nuke it a bit. Joey watched the second half of the Avatar movie he started watching yesterday. Unfortunately, when we opened the MacDonald’s bag, it turned out they had got the order wrong. None of the burgers were prepared as requested. Sandy was going to drive back but she looked exhausted, so I took one for the team and did so myself. Sandy put her feet into a hot soak instead. I think I earned a few brownie points for that. It did also put the last nail in the coffin of the idea to go back to the Magic Kingdom but I, too, was shattered anyway. When I arrived back with the now correctly prepared burgers for Joey (Jennifer had decided to live with what she got and ate it), I whipped out my Chili’s dessert. After nuking it a bit and constructing it (by drizzling the caramel and chocolate, and placing the ice cream on top), Jennifer, Sandy and I polished the whole thing off rather quickly. Delicious. I offloaded the GoPro, and Sandy and I spent a bit of time enjoying some of the footage on the laptop. We were both about to fall asleep, so we called it a night. I barely had enough energy to write up the notes from the day. This left me with two full days of blogs that I now needed to catch up on from the notes. I did want to upload all the video footage to my Youtube channel, so I set that in motion and left the laptop screen open with a large notice to not close it before the uploading process completed (it was going to take a few hours to do so). Alas, I didn’t have the forethought to switch off the bloody screensaver, which essentially would have put the computer to sleep about fifteen-minutes after I then went to be. This is actually the ride at Dreamworld on the Gold Coast that has since been shut down due to a tragic accident a couple of years ago in which four people lost their lives.